Baton Rouge, La - At the joint annual conference of LSU AgCenter and the SU Ag Center on Dec. 16-17, faculty and staff members received awards for exceptional extension and research programs. 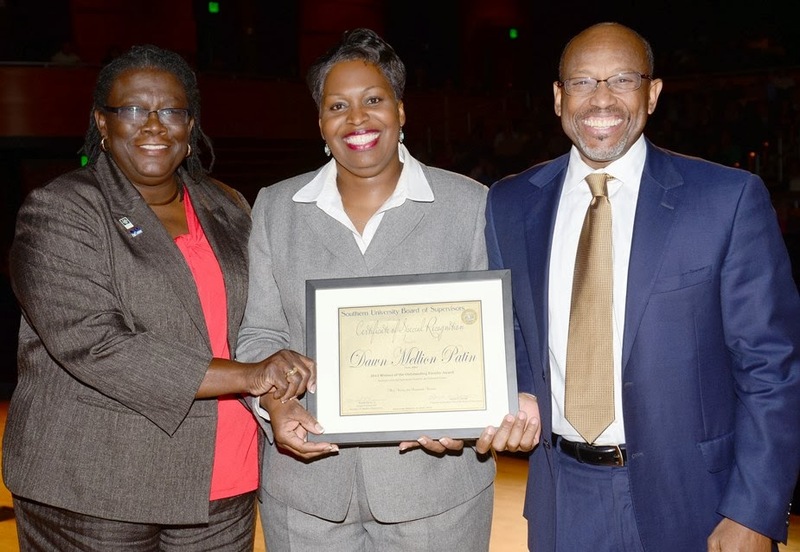 The Southern University Agricultural Center recognized two individuals, Dawn Mellion-Patin, extension specialist, and Renita Marshall, animal science researcher. Mellion-Patin received the Outstanding Specialist Award for work with socially disadvantaged, limited-resource agricultural producers and their families. She has accumulated $4.9 million in competitive grant funding to conduct extension programs, such as the Small Farmer Agricultural Leadership Institute, the Academy for Youth, and the Wisteria Alliance Project. During 2013, she worked with the Farmer to Farmer Program, which is a joint effort with the University of Fort Hare, Eastern Cape, South Africa; Florida A&M University in Tallahassee; and the U.S. Agency for International Development. 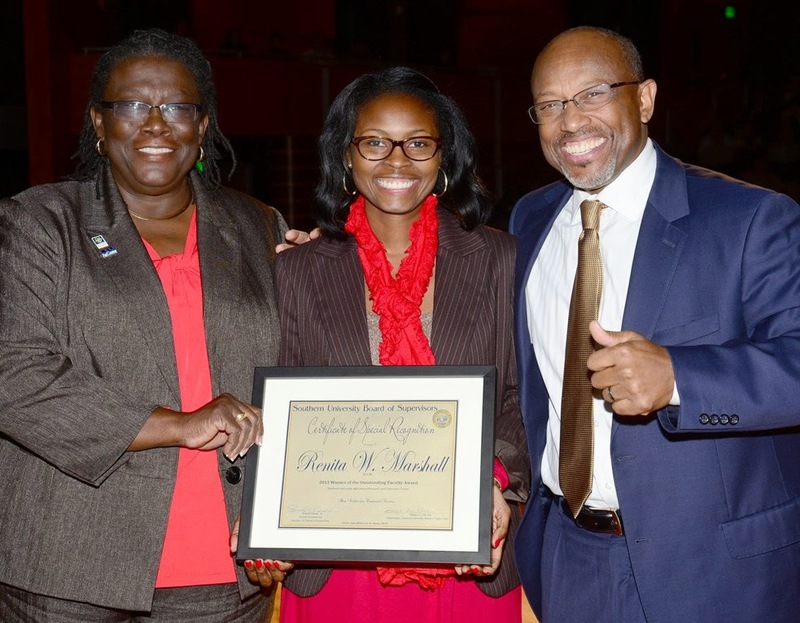 Marshall received the Outstanding Researcher Award for her contributions to the field of small-scale livestock production. Marshall has published extensively and garnered more than $2.6 million in federal funding. One of her projects is JAGS in AG, which is designed to introduce young people to the world of agricultural research. The Louisiana State University AgCenter recognized several individuals and teams at the joint conference. Dorin Boldor, an associate professor in the Department of Biological and Agricultural Engineering won the G & H Seed Company Research Award; Dan Gill, extension horticulturist, won the Floyd S. Edmiston Award; Mike Hebert, extension agent in Lafourche Parish, won the Extension Excellence Award; Don LaBonte, sweet potato breeder, won the Doyle Chambers Research Award; The Acadiana Beef Cattle Educational Program Team won the Denver T. and Ferne Loupe Extension Team Award; Scientists in the Department of Biological and Agricultural Engineering won the Tipton Team Research Award; and Two agents from St. Charles Parish won the Rosalie Bivin 4-H Youth Development Faculty Award. Baton Rouge, La - The 2013 Fall Initiation for the Louisiana State University Chapter of Gamma Sigma Delta was recently held in the Nelson Memorial Building. Guest speaker was Dr. William B. Richardson, vice president for agriculture and the Chalkley Family Endowed Chair and Dean of the College of Agriculture. 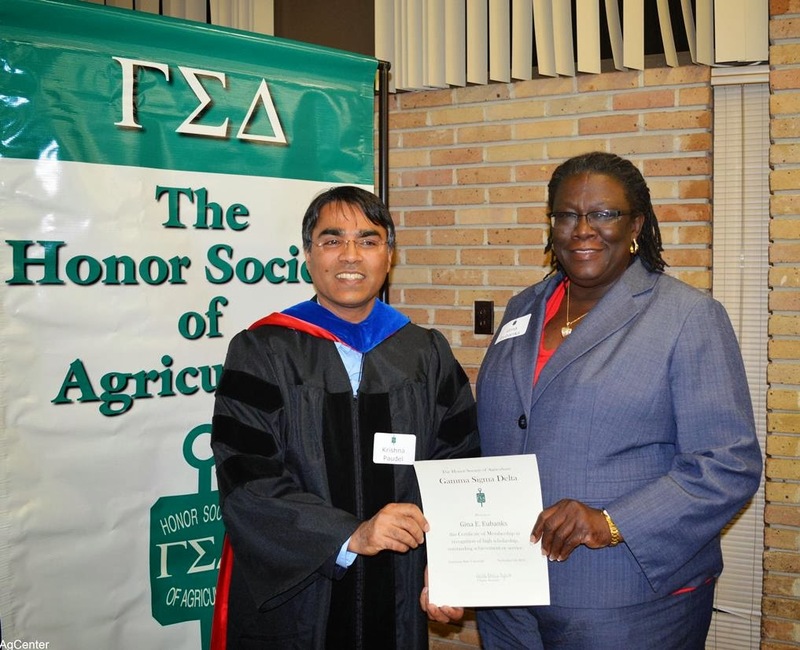 Dr. Gina E. Eubanks, vice chancellor for extension at Southern University Ag Center was initiated, and is shown receiving a certificate from Chapter President Dr. Krishna Paudel. Eubanks also serves as program leader for food and nutrition at the LSU AgCenter. Baton Rouge, LA - The residents of Louisiana and Mississippi have the worst health in the United States, according to the United Health Foundation’s America’s Health Rankings. The states tied for 49th place in health indicators in 2012. They also rank at the top — Mississippi first and Louisiana second — of Poverty in USA’s national list for poverty. Two programs in Louisiana are targeting poor health profiles: Healthy Communities in West Carroll Parish and HealthyBR in East Baton Rouge Parish. Those parishes, located in nearly opposite ends of the state, may seem completely different. West Carroll Parish is rural, for instance, while East Baton Rouge Parish is urban. Both parishes, however, exceed the national overall poverty rate of 14 percent. Both have adult obesity rates of 32 percent and a comparable prevalence of diabetes — 11 percent of East Baton Rouge residents and 13 percent in West Carroll. In East Baton Rouge Parish, the Mayor’s Healthy City Initiative is taking a three-part approach to become healthier: HealthyBR, MedBR and the Healthy Innovation Center for Research. Several initiatives fall under HealthyBR, including Fresh Beginnings, a three-year project that strives to increase healthy food access and promote health and fitness education. Fresh Beginnings grant coordinator Lyndsi Lambert said the project faces a complex combination of problems. Many Baton Rouge citizens are obese, have heart disease and diabetes, and are uninsured. East Baton Rouge Parish has seven “food deserts” — low-income pockets more than a mile away from the nearest grocery store. This challenge is being tackled by the Food Access Policy Commission, which launched in February as part of Fresh Beginnings. About 23 percent of the parish is food desert, according to Stephanie Broyles, commission member and assistant professor at Pennington Biomedical Research Center. The commission is studying the best ways to develop a business structure that can support more food options in areas of low access. Broyles said while access to healthy foods does not automatically mean eating healthy, people cannot be expected to make healthy choices without access. “Once that barrier is removed, then they bear a much larger responsibility for their health and how they respond to messages about the importance of making healthy decisions,” she said. One approach to remove the food desert barrier is The Red Stick Mobile Farmers Market, part of the Fresh Beginnings program. The mobile market operates on Wednesdays at the Scotlandville Library (9am-11am) and Star Hill Baptist Church (12:30pm - 2pm); and Thursdays at the Delmont Service Center (8:30am-10:30am) and the McKinley Alumni Center (12pm-2pm). Both SU and LSU Ag Centers are involved in educating the public on the benefits of eating locally grown fresh produce and maintaining a healthy lifestyle. Located in Louisiana’s northeastern corner, West Carroll Parish ranks 33rd out of Louisiana’s 64 parishes for health. Just three years ago, however, it ranked ninth. That decline is one reason West Carroll Parish was selected as the pilot location for Healthy Communities, an initiative that officially launched in October to improve health in rural Louisiana. It is a joint effort of Pennington Biomedical Research Center and the agricultural centers at LSU and Southern University. Gina Eubanks, Southern University Ag Center vice chancellor for extension and LSU AgCenter associate vice chancellor, said Healthy Communities’ goal is to enhance residents’ health from every angle — eating habits, exercise, healthcare, recreational facilities and food access. Southern and LSU extension agents in the parish will focus on demonstrating the importance of being healthy. One objective is making people more aware of health services in the parish. Because rural areas generally have fewer or more limited health services than cities, it is important to get people’s feedback and ensure they suit their needs, Eubanks said. Educating and engaging residents is also crucial. “Health is very personal,” Eubanks said, meaning people need to both understand how making better lifestyle choices will benefit them and be equipped with practical knowledge. Healthy Communities may be a “three to six year ordeal where it’s truly going to take chipping away ... to see what makes a difference,” said LSU AgCenter extension agent and Healthy Communities coordinator Monica Stewart. Eating healthy is not an option for many residents, a quarter of whom live in poverty. With only one gym and one park in the entire parish, there just is not much to do, so many residents lead a sedentary lifestyle, Stewart said. For more information about HealthyBR, visit http://healthybr.com/. Healthy Communities is available on Facebook https://www.facebook.com/HealthyCommunitiesWestCarroll?ref=stream. Baton Rouge, LA – Agriculture Secretary Tom Vilsack announced on November 25, 2013, the availability of nearly $10.5 million in U.S. Department of Agriculture (USDA) grants to help agricultural producers enter into value-added activities designed to give them a competitive business edge. Click here for the full news release. "U.S. agriculture is connected to one in 12 American jobs, and value-added products from homegrown sources are one important way that agriculture generates economic growth," Vilsack said. "Supporting producers and businesses to create value-added products strengthens rural economies, helps fuel innovation, and strengthens marketing opportunities for producers – especially at the local and regional level." The project is supplying emerging markets with locally grown produce to enhance production, marketing and distribution infrastructure among women and minority landowners in persistently poor rural communities. Additional examples of how VAPGs assist local and regional food producers are available on the USDA Know Your Farmer, Know Your Food Compass, which is searchable by zip code and key word.